Princeton Landing News: Attention Parents: The Grasshopper Hopped! As the readers of this blog know, we often post information about the natural world. 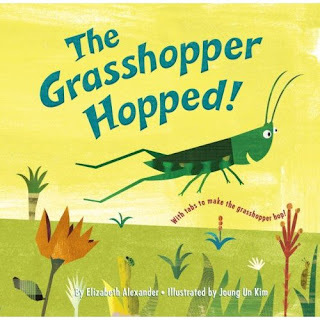 So we are especially delighted to announce the publication of The Grasshopper Hopped!, a book for children by Elizabeth Alexander. A determined little grasshopper sets out to find the right place to be. He checks out a too-hot soup pot, a too-cold fridge, a too-loud clock, the too-wet sea and the mouth of a hungry frog — but we're not going to give any more away. The captivating story takes children along on the journey and the fun interactive tabs allow them to join in and help the grasshopper find his best place to be. The illustrations, in a cut-paper style by Joung Un Kim, are a visual treat for both children and adults. The Grasshopper Hopped! will amuse and charm children ages 2 to 8. It follows Elizabeth's success with Little Pumpkin's Big Surprise! Click here to order from Amazon.